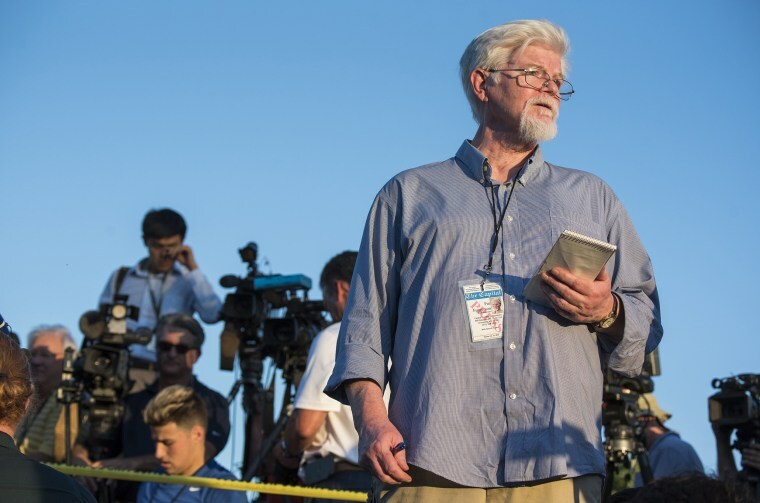 Thursday’s deadly shooting at the Capital Gazette newsroom in Annapolis, Maryland, is the latest tragedy in which ordinary Americans doing nothing more than their jobs have become victims of gun violence. But the rampage, allegedly carried out by a man who had unsuccessfully sued the paper for libel in 2012, also represented an assault on journalism itself — at a time when it’s already under threat. I was a local television reporter at WCHS-TV and WBOY-TV for more than a decade in my home state of West Virginia. I know firsthand how embedded local reporters are in their communities. I had a relationship with the viewers and I worked hard to produce fair and accurate stories. Because when you’re talking to and about your own community, there is no such thing as “just another story.” Whether I was reporting on tragedies like natural disasters, murders and mine accidents, or hopeful stories about tourism opportunities and small-town successes, I knew the people involved. I knew my friends and family in the state were depending on what I was saying, what I was asking and what information I was providing. Journalism is always about trust, but local journalism in particular relies on a unique contract between reporter and audience. Viewers helped our team get through breaking news moments in our own lives. My husband and I were anchors together, and viewers supported us when we get married — clips of the ceremony even aired during a broadcast. Viewers also saw my pregnant belly grow, and they prayed for us when our week-old daughter had open-heart surgery; I received hundreds of supportive cards and emails. I also know how important local journalism is in highlighting issues that otherwise might fly under the radar of national news organizations, especially given the ever-present competition for page views and ratings. Indeed, local reporter Eric Eyre of the Charleston (W.Va.) Gazette-Mail won a Pulitzer Prize in 2017 for reporting on the opioid crisis in West Virginia — a story that national outlets at the time were ignoring. A member of the community, Eyre cared enough to dig in. And yet a year later, this same paper faced bankruptcy. Fortunately, a group of local investors pooled their money together to help buy it. Local journalism faces these threats every day across the country. The journalists who were senselessly gunned down Thursday were working to tell the stories of their state, of their neighbors, of their community. Amazingly, amid the tragedy, their colleagues, several of whom hid under desks during the spree, managed to put out a newspaper on Friday. Fair and fearless journalism doesn’t just knit together communities — it plays a vital constitutional role. And here, too, it’s under threat. But fair and fearless journalism doesn’t just knit together communities — it plays a vital constitutional role. And here, too, it’s under threat. President Donald Trump has attacked and mocked journalists by name. He has mused about stricter libel laws. He has said reporters who write about leaks should spend “a couple days in jail.” And of course he has constantly labeled stories he doesn’t like “fake news.” Make no mistake. These frequent, vitriolic assaults on the mainstream media are part of a concerted effort to undermine trust in objective reporting, and to intimidate journalists into going easy on him. It’s easy to demonize journalists. And of course, they aren’t perfect — who is? I don’t agree with everything my former colleagues said or did. As an elected official for eight years, I took my fair share of criticism — sometimes warranted, sometimes not. But the current attacks on the First Amendment — and that’s what they are — are attacks on our democracy itself. The Fourth Estate is as important as any part of our system because it questions our leaders for us, and holds them accountable to the public. No one but a free and robust press can play that role. Journalists aren’t the enemies of the people. Journalists are the people. And now more than ever, they’re an indispensable part of our constitutional system. Natalie Tennant is the manager for state advocacy for the Brennan Center for Justice, and is the former West Virginia Secretary of State. She was a local TV reporter in West Virginia for close to a decade. Natalie Tennant is the manager for state advocacy for the Brennan Center for Justice, and is the former West Virginia Secretary of State. She was a local TV reporter for in West Virginia for close to a decade.